The Drake Agricultural Law Center developed their online legal resource as a way of making their free publication “The Legal Guide for Direct Farm Marketing” more accessible, providing regular updates on direct farm marketing law and policy, and allowing readers to ask questions directly to Center staff and law students. The website is available here: http://directmarketersforum.org/. The Direct Marketing of Specialty Food Products online curriculum will help farmers learn strategies to direct market food and sell online, evaluate the role of technology in their businesses in regards to direct online marketing, examine strategies necessary to deal with technology and weigh some cost/benefit measures, and more! Access this online course at http://communityvitality.unl.edu/directmarketingfood. Local food guides for all six Northern New York counties have been assembled by the North Country’s Cornell Cooperative Extension associations in collaboration with GardenShare, based in St. Lawrence County; and Adirondack Harvest, the community-based local foods organization serving 13 northern counties. The farmer-driven Northern New York Agricultural Development Program invites people to discover farm stands, u-pick, farmers’ markets, community supported agriculture, organic growers and stores selling local foods across Clinton, Essex, Franklin, Jefferson, Lewis and St. Lawrence counties. For a paper copy, contact your local Small Farms Cooperative Extension agent. http://www.nnyagdev.org/index.php/local-foods/. 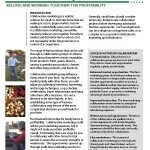 As interest in local food sourcing increases at restaurants, institutions, and schools, small farms often have to combine forces to move enough products to satisfy the larger-scale buyer’s expectations The new bulletin, “Collaborative Marketing for Small Farms” provides guidelines for farm owners who are looking to work jointly with other farms to access these new markets. Collaborative marketing is most beneficial when the farms deal effectively with legal and business considerations from start to finish. This bulletin explains the business structure options and success factors of joint ventures, partnerships, and corporations. It highlights potential obstacles and suggests practical solutions to them. After reading this bulletin, a small farm owner will be much more familiar with the ways a collaborative marketing opportunity can positively or negatively affect their farm’s bottom line. Produced by CCE of Ontario County. Download the Guide here. Cornell Cooperative Extension of Broome County is currently engaged in a project working intensively with direct marketers interested in, or currently pursuing collaborative marketing, to create and test resources to help farmers evaluate on an individual basis proposed or existing collaborative marketing relationship through qualitative and quantitative bases, and create an online and print resource center dedicated to collaborative marketing. The presentation discusses the resources and tools created during the project and how they can be applied across the state and the northeast to all types and scales of direct marketing operations. The AMS’ Specialty Crops Inspection Division, in partnership with the Wallace Center at Winrock International, presents a webinar on GroupGAP, a new certification option for our Good Agricultural Practices (GAP) audit program. This program makes GAP certification more accessible to small and medium size producers by allowing multiple growers to work together to obtain a single certification as a group. GroupGAP certification offers growers a cost-effective means to show adherence to GAP requirements. A recording of the webinar is available here. This is a manual written by the founders of Adirondack Grazers, a cooperative that formed in 2012 to assist farmers in Washington County, NY with finding a way to market their beef for a reasonable and sustainable price. This is a how-to-manual highlighting some of their learning as they traveled the road of independent farm producer to potential coop member to committed member receiving value. Read it here. New collaborative marketing models are increasingly evolving in local markets, prompting distinct changes in food supply chains. Accessing markets can be particularly problematic for smaller-scale businesses that lack sufficient volumes of products to feasibly attract and retain larger-scale buyers. Economies of scale can often result with producers and agribusinesses working together to address these production and marketing barriers. However, existing infrastructure and logistical arrangements may not be appropriate or feasible for today’s emerging local and regional food systems. Cornell’s 2013 Strategic Marketing Conference addressed these issues. The conference featured speakers from new and emerging food hub organizations, wholesale food distributors, and online marketing agencies working directly with agricultural producers. Videos of the speakers’ presentations can be found here. Another resource on collaborative marketing is the “Collaborative Marketing for Small Farms” written by Agriculture Economic Development Specialist Jim Ochterski, which can be found here. The Marketing Resource Center is intended to provide independent producers and processors with critical information to build successful value-added agricultural enterprises. The Center’s goals include an electronic, web-based library with powerful search capabilities to make value-added market, economic, and business information and other resources available to producers, and much more. http://www.agmrc.org/. The American Cheese Society strives to uphold the highest standards of quality in the making of cheese and related fermented milk products; to uphold the traditions and preserve the history of American cheesemaking; to be an educational resource for American cheesemakers and the public through sharing knowledge and experience on cheesemaking as a hobby or as a commercial enterprise with special attention given to Specialty and Farmhouse cheeses made from all types of milk, including cow’s, goat’s, and sheep’s milk; to encourage consumption through better education on the sensory pleasures of cheese and its healthful and nutritional values. http://www.cheesesociety.org/. The New York Small Scale Food Processors Association (NYSSFPA) supports and informs small-scale food processors through education, mentoring, marketing, and connections to the industry, and provides the resources to manage the challenges faced by processors in establishing and growing their food business. http://www.nyssfpa.com/index.php. A training manual with over 300 pages on selling into wholesale markets, topics including: calculating return on investment; cleaning, drying, and curing produce; traceability, packing shed design, and maintaining the cold chain. Produced by FamilyFarmed.org, single copy purchase cost $80. http://www.familyfarmed.org/wholesalesuccess/. Hazard Analysis Critical Control Point programs, or HACCP, are required for wholesale sale (not for retail) of seafood, dairy, meat and poultry products, juice and cider processing facilities, while other sectors of the food industry are coming into voluntary compliance. Penn State offers three day HACCP workshops which cover the fundamentals of HACCP and the application in meat and poultry processing operations. It provides the participant with hands-on experience in developing a HACCP plan. The course is certified by the International HACCP Alliance and meets USDA requirements for HACCP training. More information can be found here. Released by Farm to Institution New England, this new toolkit is called Setting the Table for Success: Increasing Local Food Purchasing by Institutional Food Service Management. The toolkit covers the basics of how institutional purchasing works and digs in deep into guidance for using the food service request for proposal and contract process to guide institutions in sharing the responsibility of identifying and sourcing local food with their supply chain partners. It’s set up in an online format so you can skip to sections of interest or download and print key sections. Thinking about alternative financing methods for your farm? This University of Vermont New Farmer Project Guide outlines the legal, accounting, environmental, and social effects of alternative funding. The guide includes four farmer case studies. To view the guide visit:http://www.uvm.edu/newfarmer/?Page=business/community-supported-farm-guide.html&SM=business/sub-menu.html. Just Food has developed a CSA at Work toolkit dedicated to helping both farmers and partner companies in New York City start and manage a workplace CSA. CSA at Work includes guides to understanding, planning, and maintaining a workplace CSA and five video tipsheets for CSA farmers. These videos are available in English and Spanish via their website: http://www.justfood.org/farmer-outreach/online-resource-center. If you would like to receive the CSA at Work toolkit or have any questions, please contact Paula Lukats, Just Food’s Program Director, at 212.645.9880 ext. 233. The USDA recently released the second of a multi-volume report series which provides in-depth guidance on starting and running a food hub enterprise. The report’s main focus is on the operational issues faced by food hubs, including choosing an organizational structure, choosing a location, deciding on infrastructure and equipment, logistics and transportation, human resources, and risks. The report is available online as a PDF. This guide is an on-line tool developed to help farmers evaluate their resources when considering alternative enterprises or agritourism potential for their farms. It is a database driven application that allows users to collect and store the information for each farmer and rancher’s assessment of their natural, family, and community resources. The guide is based on the NRCS publication Taking the First Step: Farm and Ranch Alternative Enterprise and Agritourism Resource Evaluation Guide dated January 2004 on the NRCS website at ftp://ftp-fc.sc.egov.usda.gov/Economics/AltEnterprise/FirstSteps.pdf. Data entry forms for each worksheet, an editable database of alternative enterprise and agritourism ideas, and an editable database of links are provided. The tool provides ease of access to related information and tools such as the Web Soil Survey, local contacts, and technical and financial assistance programs. http://resourcesfirstfoundation.org/aea/. Northeast SARE and Rutgers University have convened a multistate team to develop and deliver educational programming to agricultural educators and service providers working with Northeast farmers interested in agritourism development. The training program is multi-tiered, comprising workshops, webinars, and web-based resources focused on minimizing farm safety risks, managing liability, mitigating financial risk through enterprise budgeting, and improving marketing strategies. http://agritourism.rutgers.edu/training/.